I visualize a center. A place where women can come together to learn, to talk, to develop, to grow. A safe place. A nurturing place. A supportive place. Hostess to LLL meetings, book clubs, birth circle, birth info nights, prenatal yoga classes, birth classes, birth art workshops, pregnancy retreats, journaling workshops, craft classes, crafty mamas meetings, a miscarriage support group, postpartum mamas support group, birth counseling/consultation sessions, dancing for birth, prenatal bellydance, drop-in support chats, blessingways, red tent events, meet the doulas night, Mother’s Guide to Self-Renewal groups, women’s spirituality circles, playgroups, baby massage classes, baby/tot yoga, girls’ coming of age classes, an ICAN chapter, Friends of Missouri Midwives meetings. A gathering place. A woman’s place. It will have a large, open meeting room, access to a bathroom and another, smaller room that could be an office, consult room, or playroom. We will have counter space to plug in some minimal cooking implements (like a microwave). There will be comfy couches, chairs, toys, a lending library of books and films as well as perhaps toys/games/puzzles. There will be big pillows on the floor and beautiful art all over the walls. Other women wishing to have groups/classes for women, could also use the space for their groups/events. For me, the time has come. I feel strongly that this is my community (not “my” as in ownership, but as in responsible to), one in which I am most intimately involved. I love my community and I want it to grow, to thrive and to be all the things I know it can be…one facet of which is a women’s center. In addition to all those items listed in the above vision, I also see a need for women-owned and women-supportive businesses to have a physical space to showcase their wares. I walk in the door and see beautifully painted walls adorned with art from local women artists. A room off to the side holds information and products from the many women who are trying to earn some income for their families with fun products, like Jamberry Nails, Passion Parties, Lilla Rose, Scentsy, Mary Kay and so on. Down the hall on Tuesdays, baby sounds can be heard from the postpartum group. Wednesdays would be a different group of women and Thursdays would be yet another group of women. In the kitchen, delightful goodies from a woman-owned catering business are on display. There’s a freezer stocked with frozen meals to deliver when a woman has a time of need. Outside, a lovely garden is maintained by some women who love to grow things. On another side of the yard, a woman is giving an art class to a mixture of young and old. I turn around to see this beautiful space and take a deep breath. There is something for every woman here. It changes, as the community changes, filling the needs where possible…maybe a doula foundation someday to provide doulas to ALL women, maybe a women’s clinic with women care providers providing woman-centered care. The possibilities are truly endless. The specifics may change, but the vision of shared community, sacred WomanSpace will endure. Yesterday, I attended the Rainbow Group‘s “Day of Hope” Prayer Flag Project. It is a very moving celebration/remembrance event for families who have experienced pregnancy/infant loss. 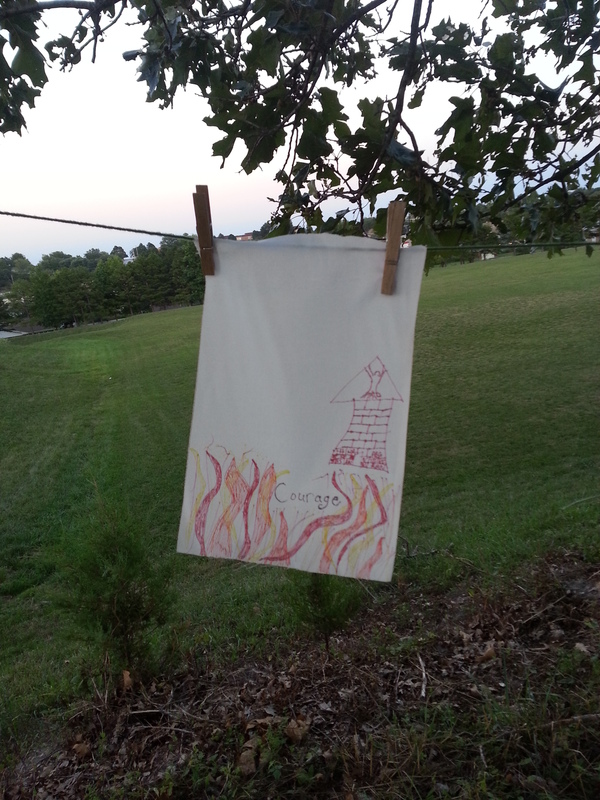 The coordinator of the event had written some thoughtful words on prayer flags for us to decorate, if we so chose, and I decided that “courage” needed to be my flag. I brought along the flag I made for my own baby-start last year, so I chose to have this flag represent what is happening in my life journey *right now*.